Beginning of 2016. we have joined our forces to create a mascot design as a part of visual identity competition for Ponikve eko otok Krk, a company which promotes island Krk as an environmentally friendly place. Their main goal is to become a fully sustainable island with 0% of CO2 emission. All team members of our group contributed to this project with specific knowledge, skills and experience, to create a mascot with a name that would represent our client in the best light. We wanted to create a mascot that would produce positive effect in all age groups and inspire them to think “eco”. First step was detailed market research that helped us create an original mascot that stands out from other creative solutions. We wanted a mascot to completely fulfil main condition of a competition – a friendly mascot that represents eco island Krk and share awareness about environmentally friendly way of thinking. Our creative graphic designers used their knowledge and benefits of “designer mind” which included creating sketches and drawing many characters to be able to choose the best creative solution. On many of our meetings we have discussed all potential solutions and with a lot of brainstorming and debating, we have concluded many interesting ideas. In the end we have decided unanimously that a cute seahorse mascot should represent eco island Krk. Seahorse is an inhabitant of Adriatic sea and it is protected species. Island Krk is also situated in the Adriatic sea. His appearance is unusual and interesting, just as a character from a fairy tale, and because of that people, both adults and children, find him friendly and positive. His eyes are also big and blue which makes him cute and approachable. Naturally, seahorse is a friendly animal and often he lives in a group. He has a special ability to change his color depending where he lives. Therefore, he can be blue, yellow, green, orange or multicoloured. A seahorse as a motive of a mascot is very rare which provides a high level of originality. 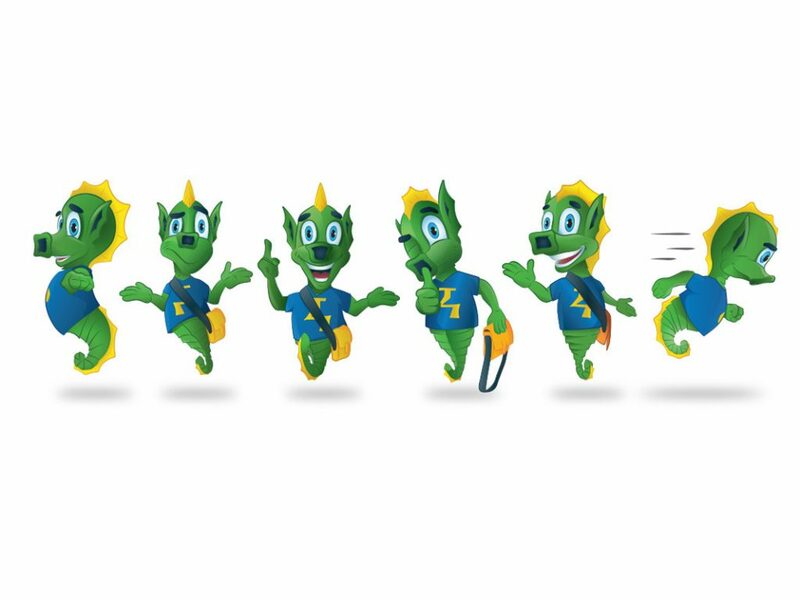 Mascot of a seahorse can show various facial expressions and body language which makes him appropriate to applicate on recycling trash bins, bags, caps and badges, t-shirts, flyers, wallpapers and other. The process of finding the most appropriate name was quite long because we wanted to find the best name to represent a synergy of island Krk and ecology. Our content masters were working on a concept of creating a name for the mascot and after a lot of potential solutions we have chosen the name KEKO. Male name Keko comes from the name of the island “Krk” and “eco”. In just one word it perfectly represents endeavor to care for the environment, eco friendly way of living, that is the main goal of island Krk. Name sounds friendly, positive, easily rememberable, audible, playful, easy to read and pronounce, and it is understandable both to croatian and foreign tourists. Although our creative solution wasn’t victorious, we are more then happy with the whole result. Every new project is a challenge that we truly enjoy, learn and grow. In the end, even though every team member has its own tasks within a project, we all make decisions together and unanimously.